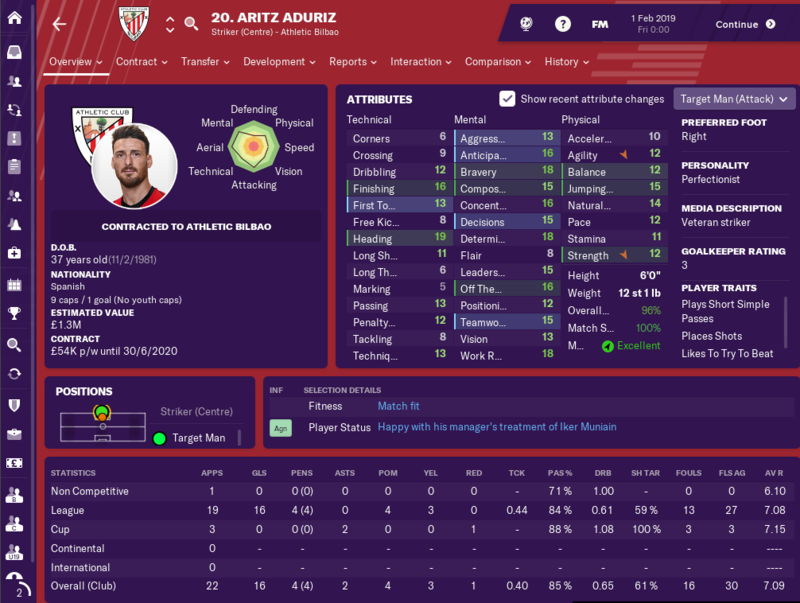 Welcome, to my first save of FM19, my beta save which will be a youth only challenge with Athletic Bilbao! 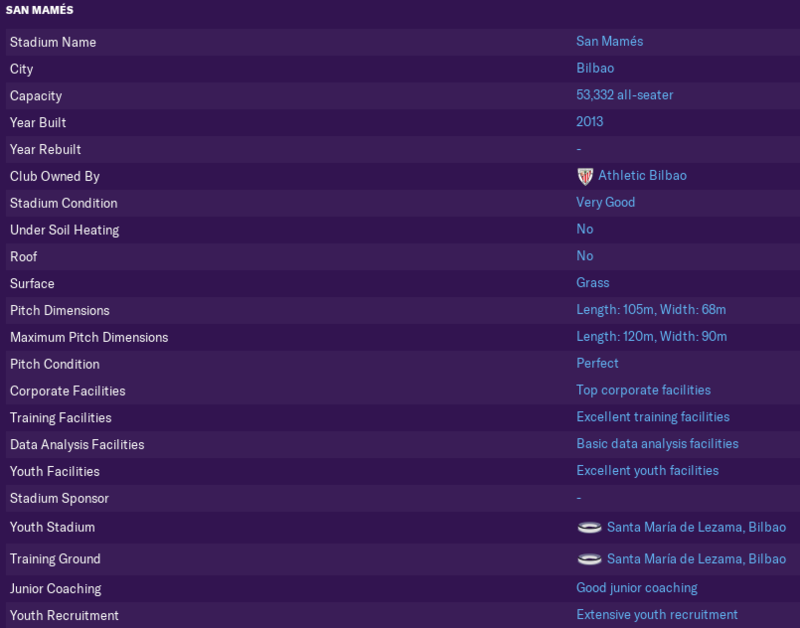 Whilst this may be youth only I have loaded Spain as playable and every other nation in Europe as view-only with a database size of 58,000 players to get a detailed level of European players, I will also be documenting any major transfers that happen during each transfer window. The aim? 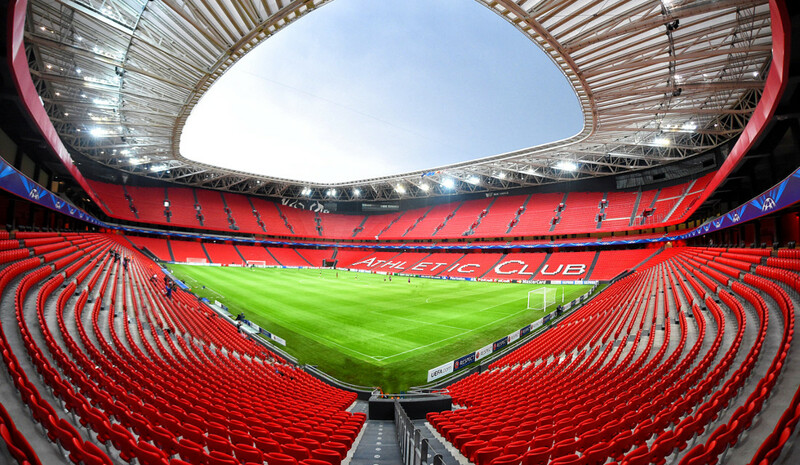 Try and win silverware, develop Basque players, new and existing and see how far we can go before the Fraud Thread kicks off! 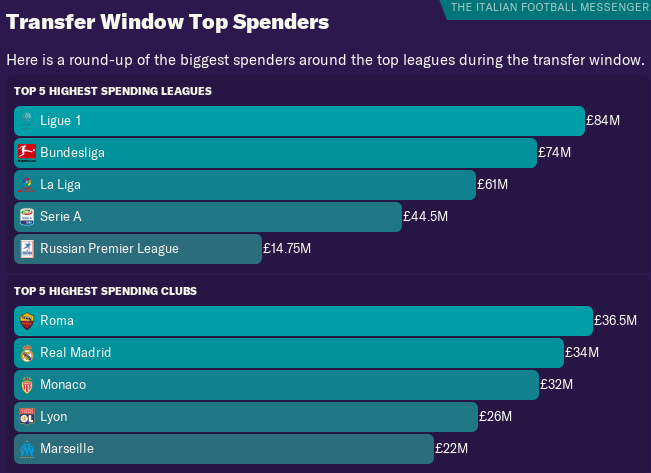 No more Kepa, no more Laporte, but we still have some very good players. This is going to be a cracking game to watch develop. Welcome to FM19, there goes our best central midfielder. 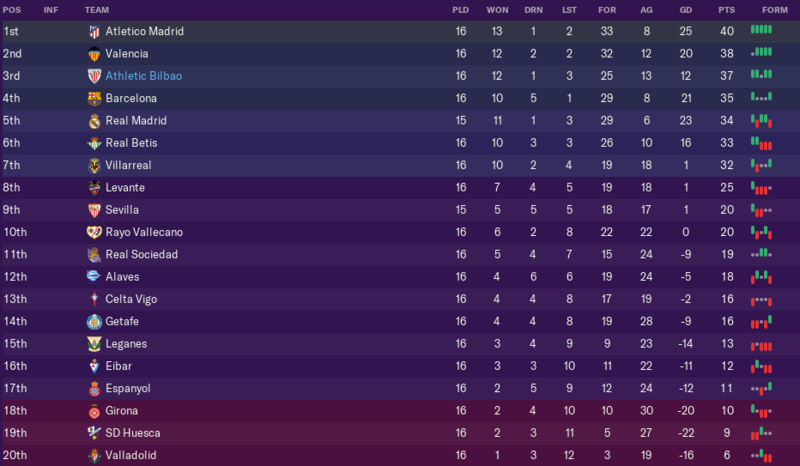 A solid pre-season, should have beaten NYRB though. 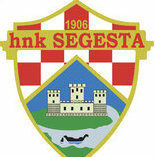 The aim is to qualify for Europe. The DoF lets one player leave, I may have to put a stop to him dealing with outgoing transfers. This is an absolute nightmare. I have started a thread with the same team as @Makoto Nakamuraon the same day as he has. 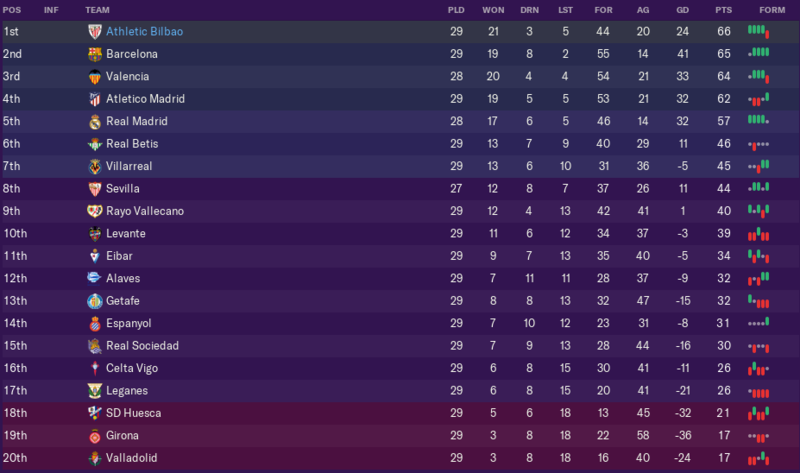 On the plus side, he will probably get his 1st intake through at about the same time as I press continue for the 1st time and then he will be having stadiums names after him just as I am being sacked mid-way through the 2nd season. 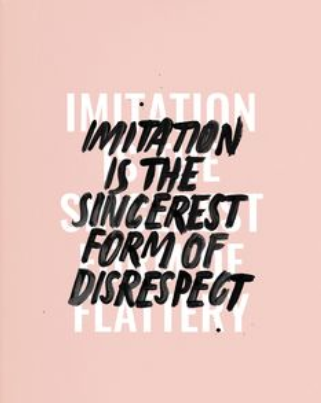 What's that saying about "imitation being the greatest form of flattery"? In all seriousness though, I would have picked someone else had I known you were also managing them, but maybe this is actually a good thing, (because I don't mind being shown up at all). This is an absolute nightmare. I have started a thread with the same team as @Makoto Nakamuraon the same day as he has with the same team as he has. 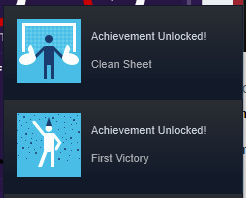 I have no downloaded tactics or instant result button, I'm just as likely to be sacked now! Best of luck with your save as well! Just the one match in August and it's great to start off with a win! The updates are flying out here already! Good luck with this. Thanks Taylor, if that's definitely you! 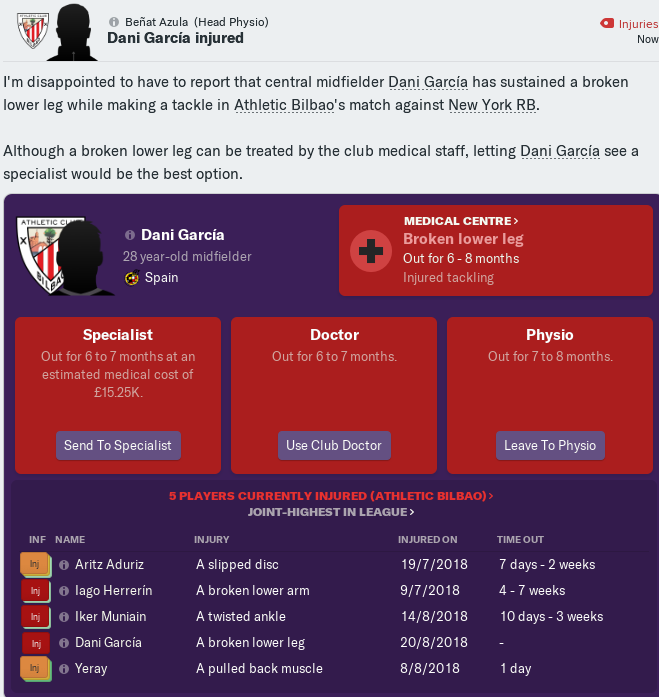 Unfortunate injury to Garcia, but good start. Thanks Kid, hopefully Garcia will be back around March. 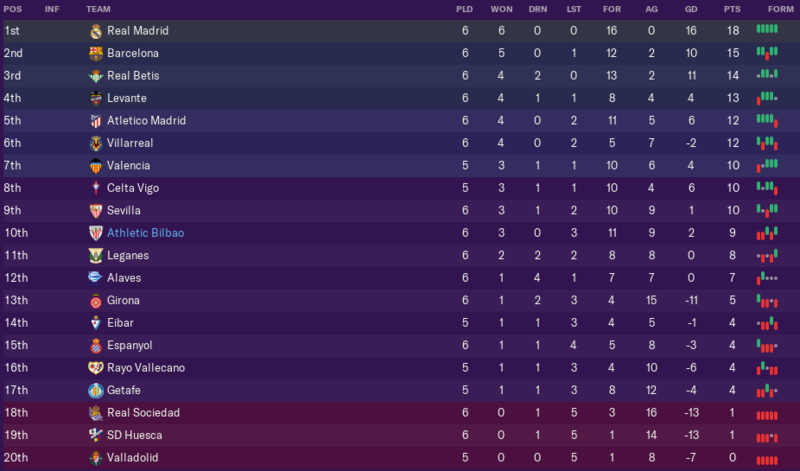 Our blushes were spared against Valencia as we were 4-0 down after 35 minutes, thankfully though, we have managed to get a couple more wins and we're smack bang in the middle of the table. 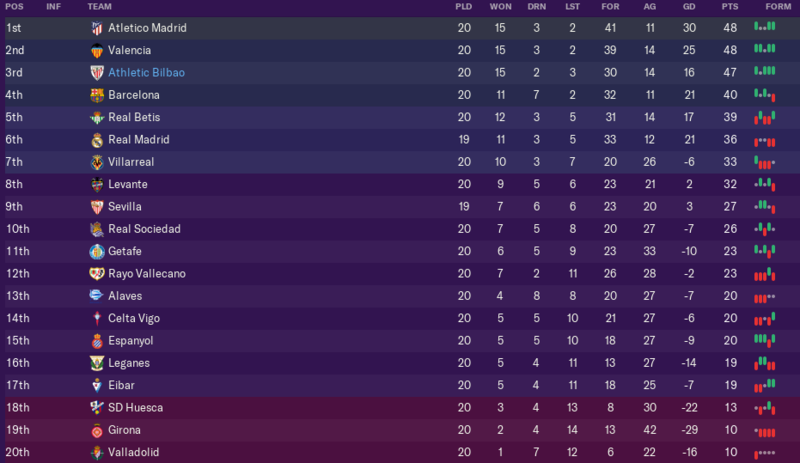 Probably some of the easiest fixtures we'll have all season and thanks to Aritz it's 3 wins from 3 which puts us up to 6th. I like the look of Oihan Sancet - he has attributes in all the right places. That is the kind of player I would promote to the first team, to benefit from enhanced training and fast development, but I am like a Louis van Gaal madman. Villalibre is another player I like the look of, has the makings of a complete forward (passing the only weakness - but not too bad), but he is at a crucial age to develop and could benefit from a higher level of football. I know it's a bit early to ask, but how's the first impressions? 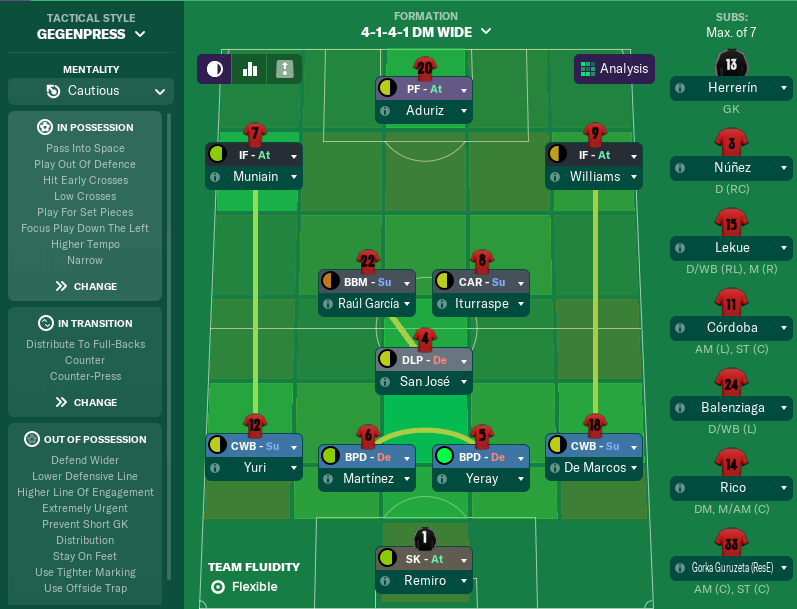 Anything that's significantly different to FM18? 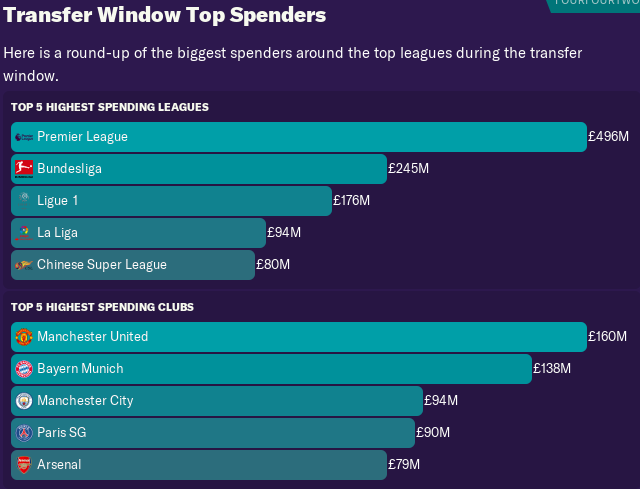 You’re winning the games you need to in order to stay competitive for the top four. 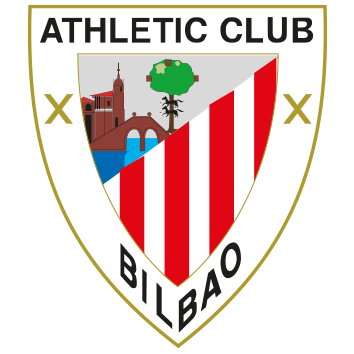 Vamos Bilbao! Both of them can definitely have a future here that's for sure, Asier Villalibre is the only reserve to make any first appearances and even then it's only been 2 but he did score a goal. I really, really like it so far, it's running very smoothly and looks great! The points are most important, it doesn't matter how we get them! 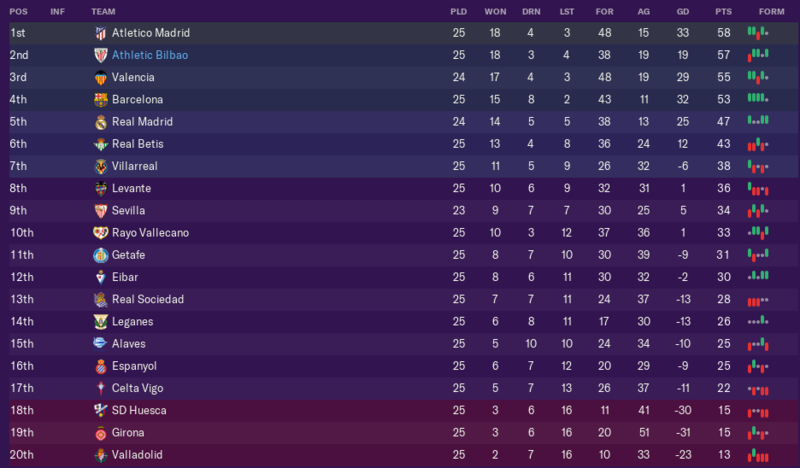 3 more narrow wins and we're up to 5th and only 3 points off of surprise leaders Real Betis! Thanks Makovn! He has room to grow still. 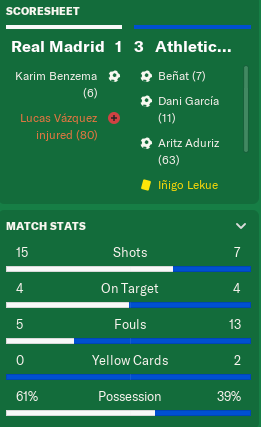 No goals conceded and we beat Real Madrid! We face Real Betis in the 5th Round of the Copa del Rey. Lot of 1 nils. Looks like a defensively sound tactic! What have you gone for? Wow, you're really firing these updates out! 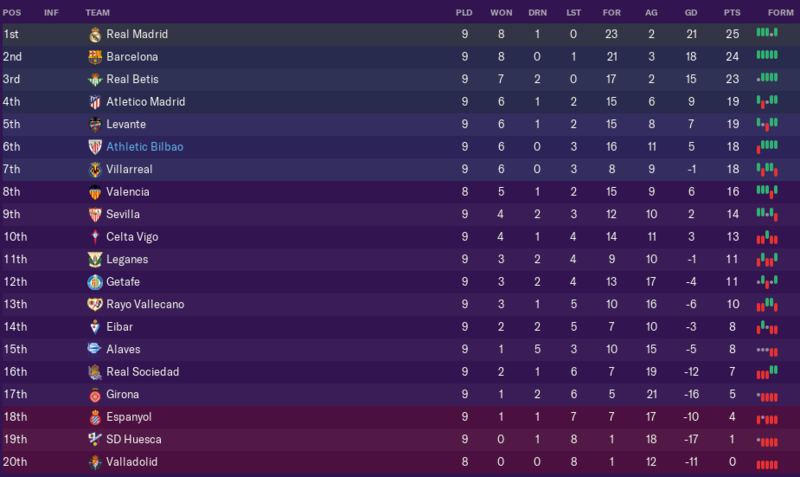 Absolutely top result against Real Madrid and it seems you have the defence nailed - conceding very few goals. As long as you score the one to ensure you get the three points, it doesn't matter how many you score. I'm going to enjoy this. Good luck Makoto! Following. Wow, you're really firing these updates out! This is what we've been rocking recently. And now the IR skins are out they should be even faster still! 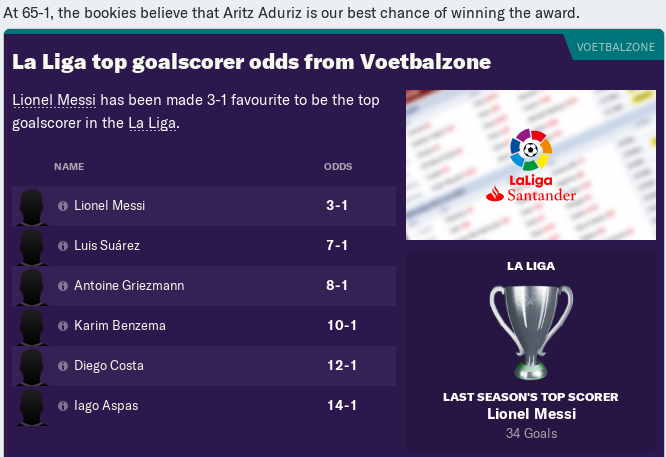 I like that after 17 games our very own Aritz Aduriz is the league's top scorer with 13 goals, 2 ahead of Diego Costa. 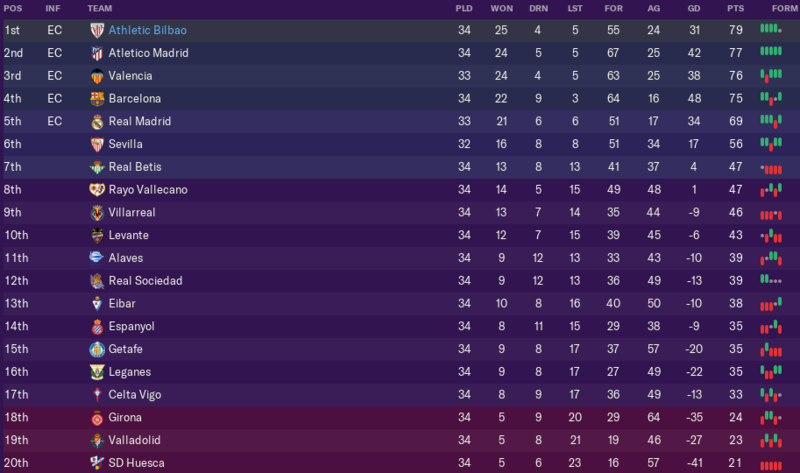 Out of the Copa del Rey after going down to 9 men in the first leg but another very good month in the league and we're now 7 points ahead of Barcelona and 11 points clear of Real Madrid! We lost the best player in the C Team during the transfer window. Declined a little bit but he's still going great! 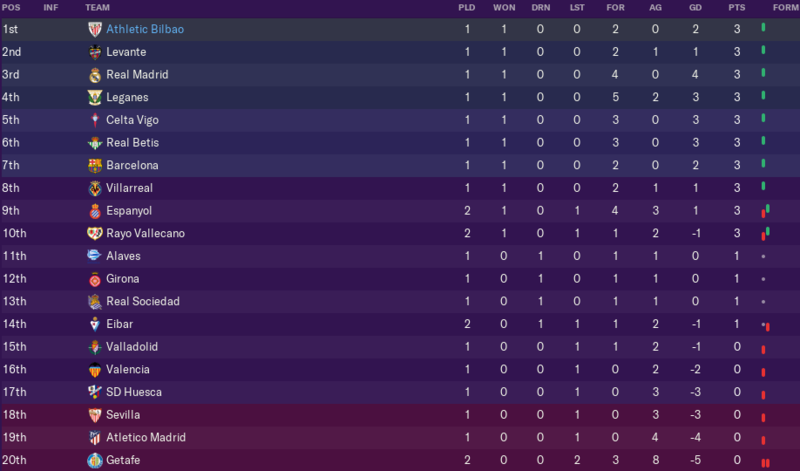 A loss to Sevilla but we're just the one point behind Atletico Madrid! 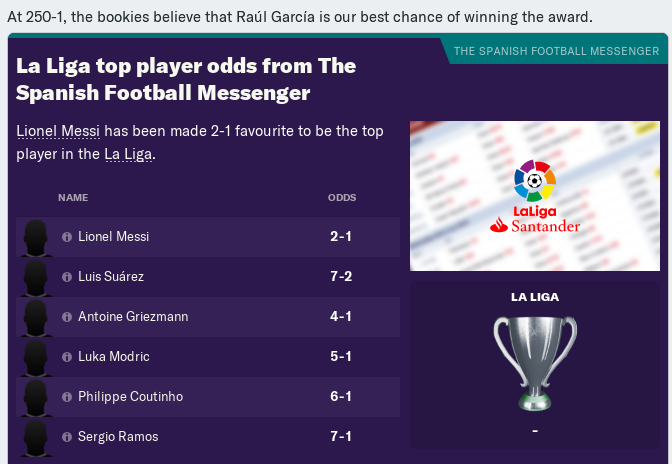 Both Barcelona and Real Madrid's form is picking up now as well, will they mount a late title challenge? No 5* players but Karla could be one of the best of his generation! Karla does look like he could develop nicely. 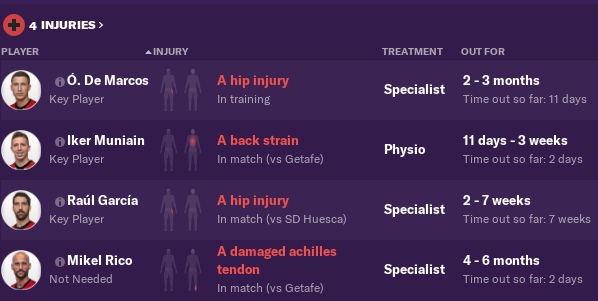 Those kind of physicals at 15 are lovely. 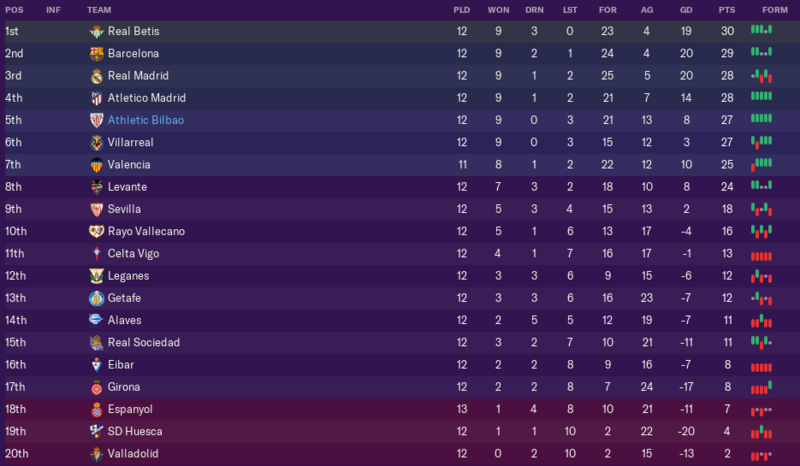 Just the one goal conceded all month but it cost us at least a point, we've managed to hit the table due to both Valencia and Atletico Madrid slip up but Barcelona's great form has shot them up to just a point behind us. Please stop getting injured. We need you for the title race! An instant result skin is already out I noticed. We're still hanging on in there! Four games to go and there's just four points separating the top four and both Valencia and Real Madrid still have a game in hand! You're actually winning the league, aren't you.